Here are a number of useful KML resources for Google Earth with data and supplemental layers. Many have been reported and shared by users in the Google Earth Help Forum or Google Earth Community (GEC) Forum. Some of the content was created by myself, and some of it created by others. US States KML has US State boundary outlines as polygons. 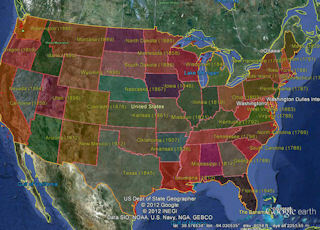 Combines multiple world time zone data and maps into a single file for Google Earth. Japan Earthquake-Tsunami Disaster March 11, 2011 (KML Tour). Vast amounts of raw geospatial data can found found at the US GEOSPATIAL ONE-STOP web site Geo.Data.Gov some of which is in KML format.